Enjoy a private, spectacular 7 acre European-style vineyard estate in the heart of Sonoma County. Enter this spectacular wine country property down a tree lined private lane through large iron gates to a very private breathtaking European style estate. The second cottage on the 7 acre property, is 800 sq. ft. sleeps 4 comfortably with private patio. All rooms are tastefully decorated with luxury bedding, HD televisions and many with gas fireplaces. Outdoors are numerous patios and walkways with a hobby vineyard (old vine zinfandel) and over 20 mature palm trees. Large natural stone pool and spa with BBQ and stereo system for endless relaxation. Rental Agreement via Docusign Required. Pool not heated, but heating available for $700.00 to cover the cost of propane to heat 11 foot pool. Rental rate is for 12 guests. Additional guests past 12 are charged at $125 per person per night. Upon enterring Villa Terra Bella you will imediately feel relaxed and like you enterred another world. Palm trees, vineyard, stone and Italian architecture create a feeling of old world hollywood luxury. Experience the life at a multimillion dollar wine country property at an affordable price! The property has three unique living spaces to allow privacy and also options for diverse groups. The hobby vineyard was donated to Windsor Vineyard Academy in 2010. The vines are over 100 years old and the wine is superb! Guests can purchase bottles of the estate old vine zinfandel wine and proceeds go to the school. We truly enjoyed our stay at Villa Terra Bella in the heart of Sonoma wine country! It was perfect for our large group of family and friends (12) and the owners made it very warm and welcoming! 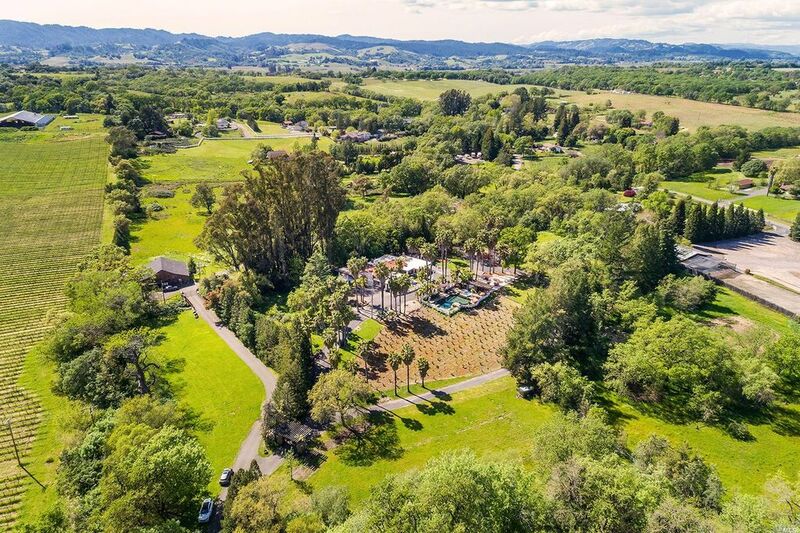 Beyond the great location (10 minutes from downtown Healdsburg/4 minutes from downtown Windsor) with access to countless award winning vineyards/breweries, the property and home were absolutely beautiful, clean, and comfortable. Our kids had a blast spending an afternoon in the heated (for a small fee) pool and on the playground. The adults enjoyed sipping wine by the fire, watching DirectTV in every room and playing horseshoes out in the well manicured lawn. The owners were also super helpful in providing recommendations on restaurants, a caterer, wine tour driver and even a professional masseuse. We hope to come back every year with our family to enjoy Villa Terra Bella again and again! Beautiful environment and grounds with lovely, well-appointed house and guest house. We loved staying at Villa Bella Terra. Our property manager, Angie, was on sight the day we arrived, extremely helpful and full of suggestions to make our stay enjoyable. The main house is large and nicely decorated. We hosted a breakfast there for family and they loved the “venue!” Pool area is pretty and the accompanying patio lovely to sit at. We were also pleasantly surprised to find a playground in the back of the property, which my grandkids loved! The guest house served us well for overflow and was just steps from the main house. Our family would go back there in a nano-second! We had an awesome time at Villa Terra Bella! The home is spacious and the owners are welcoming and friendly. Great communication and key-less entry codes made checking in and out of the villa a breeze. Our large group was super comfortable eating meals in the kitchen and using the living room and guest house. Angie was a wonderful on site manager who made sure we had everything we needed, including lots of extra towels and toiletries. Outside we enjoyed the pool, hot tub, outdoor heaters and fire pit. As luck would have it, the local HS was picking their annual grapes in the adjacent vineyards and we were invited to join the fun. While the layout of the home might not be suitable for everyone, it was perfect for our group. Thanks for a great stay! Owner is great. Only criticism - could use a better kitchen set up (new range, pots, pans, etc). I wasn't overly impressed with the property. It was ok, but not a true reflection of the pictures. The property owner and property manager were extremely professional and nice to work with, but the property did not meet our standards. The pictures paint a different version of what the place actually looks like and the layout of it. Things are very outdated and the house is awkward for couples staying in it. In two of the rooms to get to the kitchen you have to walk right through somebody else room, as the house is laid out funky. The worst part was that their were birds in the chimney while we were at the facility. We would constantly hear them chirp and it made us feel uneasy. I understand that critters can be a problem, but that should have been communicated to us prior to our arrival. Also upon arrival their were lots of amazon boxes delivered and all over the driveway/entrance, which wasn't what we wanted when being welcomed to the "Villa". As far as the overall property, I would not stay at it again. I expected a resort like feel at a high end home and did not get that vibe. The pool and hot tub controls are extremely outdated and frustrating to use, so we did not enjoy the hot tub like we were able to because of how cold it was. I don't think the people who own and run this home are bad people at all, contrary I believe they do try and make the house as enjoyable as possible...but with the pictures and a name like "Villa Terra Bella" I truly feel I did not get wha we paid for. We stayed for a weekend with a group of 12 ladies at night, with a larger group for a pool party during the day. The house is in a good location for wine tasting and tourism and will fit everyone comfortably. If that's what you're looking for, you found the right place. However, upon our arrival, we found the dishes dirty that needed re-cleaning in both the dishwasher and cabinets, toothpaste stuck to the furniture, and general neglect of the pool area (garbage and used band-aids on the ground, weeds overgrown, grime and nasty standing water in the outdoor sink area, pool accessories on the ground and in pool from previous visitors). The cleaning crew was not finished preparing the home upon our arrival, and maintenance repairmen had been scheduled to be at the house during our stay (un-ideal for a group of ladies at a swim party). Presenting our concerns to the onsite manager resulted in little help. Not the best place if you're trying to treat yourself to a upscale getaway as we were pretty disappointed with the upkeep of the property. Maria, her sister, and their friends were the most unreasonable and threatening guests we have hosted at Villa Terra Bella. We do not recommend hosting them as a group. From their first email to us, they requested discount after discount for their large group. We had complaints from neighbors 15 acres away complain about their noise levels, screaming, and late night parties. Upon departure, Maria and another one of their guests threatened to write us a bad review unless we gave them money including a "free night" and a "discount." Given the high cost of regular maintenance of a 7 acre vineyard estate especially after the fires in Sonoma County, our family decided we could not just give into their blackmail. Thus, they proceeded in writing a negative review. The property was in immaculate condition upon arrival. Our property manager gave them an entire welcome tour upon arrival and they were all overjoyed and wow'd by the beautiful and blooming property. All of the guests told our property manager how beautiful the estate was and then asked her if she thought the owners would give them a discount or a free night. When our manager checked in with them by phone during their stay they said "everything is great! please do not send anyone over because we are partying." The dishes were hand washed by our cleaning team the day of their arrival and the pool/spa perfectly prepared to host their group of 12. The handyman was sent to the property to check on a item that their group requested. Our cleaning team and maintenance team is always available should anything arise. As our property is booked every weekend, it is unfortunate that we hosted a group that threatened us with bad reviews for money as we strive to have our entire 7 acre home perfect and comfortable for others to enjoy. We are always available 24/7 for our guests to make their stay positively memorable. We welcome all guests to experience a magical and immaculate weekend at Villa Terra Bella!